The recovery and return of stolen assets has been referenced in Financing for Development outcomes since the Monterrey Consensus, and has been identified in the Addis Agenda as a crucial element towards the financing of the 2030 Agenda for Sustainable Development. The Addis Agenda encourages the international community to develop good practices on asset return. The asset recovery provisions under Chapter V of the United Nations Convention against Corruption (UNCAC), which recognises the return of assets as a fundamental principle, are largely used as the framework for global asset recovery efforts. Stolen assets are the result of one type of illicit financial flow. Since the Monterrey Consensus, progress has been made in all aspects of the process, including seizure, confiscation, management, return and disposal of stolen assets. Despite these efforts, only small amounts of resources have been returned to the countries of origin. In a 2014 survey of OECD members , foreign assets totalling $1.4 billion were frozen between 2010 and 2012, but only $147.2 million was returned to the country of origin. Surveys on asset freezing and return are not prepared annually or globally. The return of stolen asset is provided for under the United National Convention on Corruption as a legal principle under international law. Progress has been made in all aspects of the process including, recovery, seizure, confiscation, return, management, and disposal of stolen assets. Information gaps continue to exist in terms of (1) why levels of returns remain low; (2) where lie the weaknesses in the overall system (3) whether there is anything that can be done to further facilitate returns by Member States. A series of seminars for practitioners in the field of stolen assets, the Lausanne Seminars, were launched in 2001 to foster dialogue and the exchange of expertise on cases involving the recovery of stolen assets. These resulted in the creation of Guidelines for the Efficient Recovery of Stolen Assets. At the tenth Lausanne process meeting, held in March 2017, the guidelines were distilled into a list of good practices and a step-by-step guide to be followed in the procedure for freezing and returning potentates’ assets. In a parallel process, an expert group meeting convened by UNODC, the Government of Switzerland, and the Government of Ethiopia met in February 2017 to discuss lessons learned from selected cases on the management of recovered assets, and on the use of returned assets to support sustainable development. Participants generally agreed that the Convention guarantees the unconditional return of assets, that efforts should be made to ensure that returned assets are not stolen again, and that returned assets could be used for social purposes and to support investment in the Sustainable Development Goals. The Task Force recommends that States speed up international cooperation on asset return to the maximum extent allowable by law, and that they seek to learn from the compilation of past examples being developed, including on enhancing the sustainable development impact of returned assets. An inter-sectoral approach to asset return involves a wide variety of actors from requesting and requested States to trace, freeze and manage them until their ultimate return to the countries of origin. In order to be successful, steps taken by different levels of government and non-government stakeholders need to be aligned and mutually reinforced. Effective asset return is therefore based on a close dialogue and tight cooperation of all the parties involved. Figure 16 depicts the common actors in asset management and return. To achieve the objective of engaging constituents and developing inter-sectoral approaches to asset recovery, a regional meeting of experts was held in February 2017, and was attended by 89 participants from 34 countries. The meeting brought together a diverse array of practitioners, including asset recovery experts (such as investigators, prosecutors, and public finance managers), and development practitioners. The objective of the meeting was to identify good practices to improve stolen asset return and disposal in support of sustainable development. The outcome of this meeting  reflected the current “state of play” of the different legal frameworks. The report will cover the use of tailor-made solutions for the return of stolen assets to ensure that returned assets serve social and economic development goals. The need to protect the returned assets from renewed financial crime is another aspects that will be highlighted in the report. Through this inter-sectoral process, good practices are being generated from cases and previous practices of States. Similar to the Lausanne process, the final outcome of this process could be a non-binding guide or policy paper including a directory of asset recovery “best practices” drawing upon the experiences shared by experts in the various sessions. It would identify the elements of a transparent asset management regime, highlight domestic coordination mechanisms, as well as discuss sector-specific approaches to asset management and unconditional returns. It will provide case studies demonstrating previous examples of returns and will form the basis for informing future models for asset returns and disposal. The outcome of this process will also expand and update existing policy papers on the subject to date. States parties to the United Nations Convention against Corruption  have begun to examine their implementation of the asset recovery provisions of the Convention. Between June 2016 and June 2017, during the first year of the second review cycle under of the Mechanism for the Review of Implementation of the Convention, 29 countries  will undergo peer review on their implementation of the asset recovery provisions. The review of implementation will offer States an opportunity to share information on good practices and address challenges encountered in recovering assets. The 8th session of the Implementation Review Group  will take place in Vienna, 19-23 June 2017. Following the reviews, StAR and other technical assistance providers will also be better informed to provide targeted assistance which meets the needs of States. The Stolen Asset Recovery (StAR) Initiative is a partnership established in 2007 between the United Nations Office on Drugs and Crime  (UNODC) and World Bank that supports international efforts to end safe haven jurisdictions for corrupt funds. 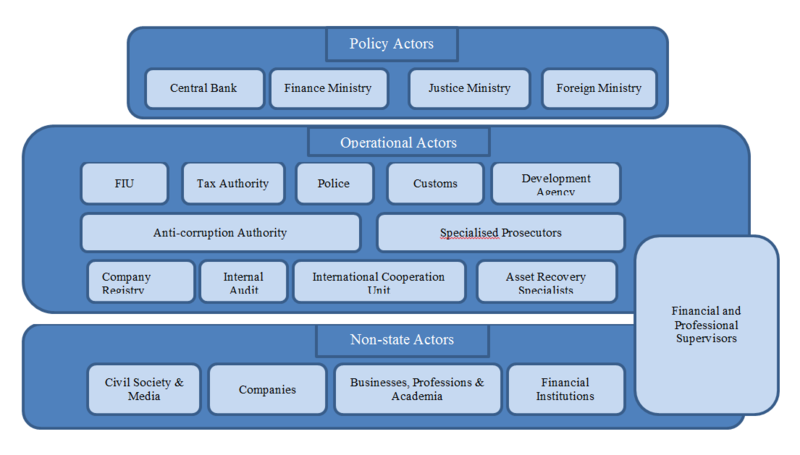 In 2016, StAR continued to provide demand-driven capacity-building or other forms of ad-hoc short-term assistance; to facilitate the return of assets, including through silent diplomacy or honest brokering; to work on the development and finalisation of several publications; and to support asset recovery networks across the globe. During 2016, StAR carried out technical activities in about 24 countries representing approximately 60 per cent of StAR’s activities. The UK Anti-Corruption Summit also created a new Global Asset Recovery Forum which will hold its first meeting with support from StAR in 2017.